‘We must not forget that these little [village] communities [in Hindostan] were contaminated by distinctions of caste and by slavery, that they subjugated man to external circumstances instead of elevating man to be the sovereign of circumstances,… exhibiting its degradation in the fact that man, the sovereign of nature, fell down on the knees in adoration of Kanuman, the Monkey, and Sabbala, the Cow’ (On Britain pp. 383-84). When I first read this passage in the early 1960s quite naturally I took Kanuman as a misprint for Hanuman. Some years later in a collection of extracts from Marx-Engels’s articles and letters entitled On Colonialism, I found the error corrected and the names previously printed in italics now in normal/roman (p.37). Similarly in a collection of articles and letters on the 1857 rebellion known as the Sepoy Mutiny I found the same corrected reading (The First Indian War of Independence 1857-59, pp.20-21). It was also reassuring to learn from the ‘Publishers’ Note’ of this book that ‘[t]he text of the articles which were printed in the New-York Daily Tribune has been reproduced from that newspaper. Certain sentences inserted by the editors of the Daily Tribune and obvious misprints have been eliminated. The spelling of proper names is wherever possible given according to modern sources’ (p.4. Emphasis mine). The Bangla translation of this collection contains the same Editors’ Note and in the passage quoted above there is Hanuman instead of Kanuman (p.20). Great was my surprise when in Marx-Engels Collected Works (MECW), vol.12 (first published in 1979) I discovered Kanuman making its reappearance (p.132), but this time in roman, not in italics. Why should the corrected version be replaced by an obvious misprint? The answer became crystal clear when I looked at the facsimile (reduced) of a page of the American newspaper in which Marx’s article first appeared (reproduced in MECW vol. 12, p. 129). It was found that the printed version indeed had Kanuman and Sabbala in roman, and that is why the learned editors of the MECW decided to go back to the first printed version, disregarding all attempts at corrections and emendations undertaken by other editors of Marx’s individual works and collections of articles that appeared between 1853 and 1979. A strange editorial policy: instead of advancing from the diplomatic edition to the critical edition, it was the other way round. The Marx Engels Werke (MEW), which includes German translation of this and other articles written in English and French by Marx, however, prints the corrected version: Hamuman, not Kanuman (9:133) but retains Sabbala (which should be Sabala). But this is not the only reason I picked up this passage. Apparently Marx as yet did not know much about totemism, animal worship, etc. Lewis Henry Morgan’s Ancient Society, the work that impressed and influenced Marx and Engels so much, did not appear till 1877. Marx read Morgan and other works on anthropology and ethnology mostly in 1880-81. Hence in 1853 he did not understand why animals are worshipped in the early stages of human civilization all over the world. Hanuman is a cult figure mainly in the so-called cow belt in north India, not so much because of the original Sanskrit version of the Ramayana but mostly due to the Ram-charit-manas, the rewritten Hindi version of the Ram legend by Tulsidas (sixteenth century). 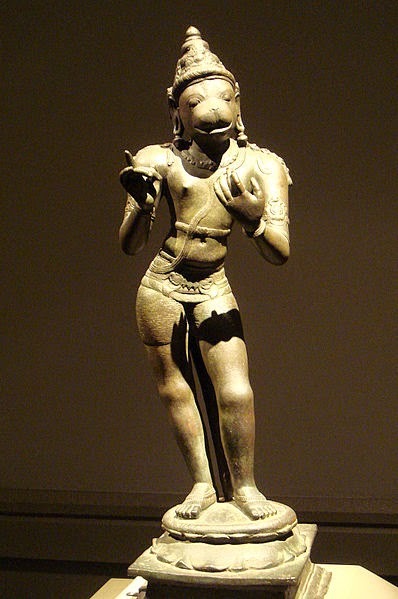 (For a study of this monkey god, see Lutgendorf’s Hanuman’s Tale). You are an ox, and how! And only for a cow! Marx, apparently following Heine, had connected Visvamitra and Savala, the cow in his 1853 article (see above). But in the legends, there was no question of Visvamitra, then a king, tormenting himself (in extremely painful and arduous tapas, ascetic practice) for the salvation of Savala. Visvamitra originally belonged to the Warrior caste (Kshatriya), but having seen the power of a Brahmin, Vasishtha, who had been made master of every vasu or desirable object by this cornucopia of a cow, he wished to become a Brahmin himself. This is why he devoted himself to the performance of a long penance. Possession of ‘the cow of plenty’ was no longer of primary importance to him; he aspired for Brahminhood. And he was not denied the fruits of his endeavour. He was successively made ‘the royal-sage,’ rajarshi, then a full ‘sage,’ rishi, ‘the great sage,’ maharshi, and ultimately, ‘a Brahmin sage’, brahmarshi. The story of the conflict between Vishvamitra and Vasishtha has been considered symbolical of the struggle between the Kshatriyas and the Brahmins. But the variations in the stories concerning these two sages found in Vedic literature, and then in the epics and the Puranas,6 are irreconcilable; any inference to be drawn from any part of the accounts is liable to be false. Marx apparently knew nothing of all this. But he remembered both ‘Wiswamitra’ and the row over a cow learnt from Heine’s song. But what was the source for Heine’s (mis)understanding of the story? He had no Sanskrit, but presumably learnt the story of the conflict between Visvamitra and Vasistha from Franz Bopp (1791-1867), the indefatigable Sanskritist and translator. Bopp wrote a book in German on the conjugation system of the Sanskrit language (1816).7 However odd it may seem, the story of Visvamitra is given there in metrical German translation from the original Sanskrit Ramayana (Winternitz 1:14, 388-89, 458 n4). Heine’s song was written in 1823/1824 and included in a book of songs (Die Heimkehr, Homecomings) published in 1827. Marx was then a mere child. Marx referred to two animals, Hanuman and Sabala, in his 1853 article, and mentioned with occasional misspellings Sabala again in two letters in 1866. The reference to cows was occasioned by a long debate (6–20 Feb 1866) in the British Parliament. Members of both houses wrangled vigorously on the compensation to be awarded to the cattle owners in the event of epizootic diseases. But Heine does not mention any of the several names of the wish-fulfilling cow (see above). So Marx must have got it from some other source. And wherefrom did he learn of Hanuman? In his student days at Bonn Marx had attended the lectures on philosophy and literature given by the Romantic linguist, August Wilhelm von Schlegel (McLellan p.13), but they were on Homer and Propertius, not on Valmiki and Vyasa. Marx never attempted to learn Sanskrit or any Indian language, although in his article, ‘The Future Results of British Rule in India’ (22 July 1853, published in the NYDT, No. 3840, 8 August 1853) he extolled India as ‘[the] country [which] has been the source of our languages’ (On Colonialism p. 81; MECW 12:221) as did Hegel (‘In recent times the discovery has been made, that the Sanscrit lies at the foundation of all those further developments which form the languages of Europe; e.g. the Greek, Latin, German.’ Philosophy of Historypp. 141-42).8 There is no evidence that Marx had read the first Books of the Ramayana available in A.W. Schlegel’s Latin translation, or in the English version produced by William Carey and Joshua Marshman published from Serampore, Bengal. Nor is there any other reference to Hanuman or any character of theRamayana in his later writings. Hegel, as any reader acquainted with the Ramayana will recognize, had thoroughly misunderstood the role of Hanuman in the epic. Hanuman is not at all a prince (Angada, Bali’s son, is the only one), nor can he be called by any stretch of imagination ‘a friend of Rama’. Marx in his turn fails to comprehend that it was not Sabala, the kaamadhenu who is worshipped; the cow as a species is one of the many objects of animal worship current in India. Furthermore, Sabala was not the object of Visvamitra’s penances; he aspired after attaining Brahminhood. It was not for her salvation that Visamitra performed penance after penance; they were all for his own self. Marx only remembered these two animals and associated them with animal worship which he thought to be demeaning for humans. And thus he condemned the Indian villagers for worshipping Hanuman the monkey and Sabala the cow. Hegel could assimilate deified Hanuman with his concept of the Absolute: Marx saw only disgrace of the homo sapiens in animal worship. There were always such disbelievers and rationalists in every phase of Indian history. An inquisitive reader may still enquire: Wherefrom did Hegel, who had never studied Sanskrit, learn the story of the Ramayana? It is true that no complete translation of the Ramayana was yet available in any European language,9 yet Hegel was acquainted with the Latin translation of the Ramayana (Books 1-3) done by August Schlegel (mentioned above), which has been acclaimed as his ‘most significant work’ (Winternitz 1:13). Hegel specifically mentions the translations of the Ramayanaand the Mahabharata in his Philosophy of History: ‘Two great epic poems, Ramayana and Mahabharata, have also reached Europe. Three quarto volumes of the former have been printed; the second volume is extremely rare’ (pp. 159-60). The German editor adds in a note: ‘A. W. v. Schlegel has published the first and second Volume (sic); the most important episodes of the Mahabharata have been introduced to public notice by F. Bopp, and a complete Edition had appeared at Calcutta’ (qtd. in Hegel, Philosophy of History p. 160n). Hegel mentions the story of the descent of the Ganga as described in the Ramayana (Aesthetics 1: 344). Even though A. W. Schlegel had not translated a part of this episode (the scene of Siva lying with Uma in conjugal embrace), Hegel managed to get hold of the Charles Wilkins’s (1749–1836) English version (I wonder how and where he got it). Hegel noticed that Wilkins too ‘had no mind to translate word for word because it is all too wanting in decency and shame’ (1: 344), nevertheless Hegel managed to fill in the gaps in the story. In his usual self-confident way he then proceeded to compare the accounts of theogony of the Indians with those of the Scandinavians and the Greeks (1:345). Hegel further discusses the view of purification and penance based not only on the Ramayana and the Mahabharata, ‘but also many other poetic works of art [that] provide the most important samples’ (1: 346-47). There is an indirect reference to Viswamitra’s penance here too (‘The end of acquiring the power of a Bramhana’ 1: 346-47). Hegel had read (all in translation of course) more of Indian literature and philosophy than Marx.10 With the kind of self-assurance one usually associates with genius (in case of lesser mortals which would be criticized as audacity), he could expatiate on the two Indian epics, although he could not have read either from cover to cover.11 In spite of his very limited acquaintance with the philosophies of India, he would comment authoritatively on the Indian way of thinking and its relation to the Absolute (see, for instance, Aesthetics 1: 336 quoted above). He never thought that he could have misunderstood any text, which he often did, for example in retelling the story of Nala and Damayanti (Aesthetics 1: 215 and n1, also Philosophy of History, pp. 151-52).12 Marx, by following Hegel and Heine, had merely compounded some follies. However, these follies do not affect Marx’s thesis concerning the nature of the British rule in India; they merely offer some comic relief. Whether Marx translated the lines himself or quoted it from someone else’s is not known. The editors of MEW are silent over the matter, and those ofMECW apparently could not make up their mind. At first they say that ‘Marx gives a fee rendering of the words from Heine’s poem’ (p.242 n b), and then ‘Marx quotes an English translation of the second stanza of the poem…’ (p.245 n b). Prawer however categorically states that Marx himself translated the stanza of Heine’s song ‘into English doggerel’ (p.380). Special attention, however, is to be paid to the word ‘ox’ (wrongly rendered as ‘oxen’ (in plural) in Marx’s letter) in Heine’s song. Ochs in German, besides meaning an ox, is also used figuratively to suggest a blockhead, a fool (The French translation of Heine’s song by Pierre Mathé (2009) has: ‘Oh quel boeuf tu es’). Proclaimed afar the sage’s gratitude. In frightful bellowings manifest their dismay. Similarly Karl Ludwig Doerne (1786-1837), a German political writer and satirist, observed: ‘After Pythagoras discovered his fundamental theorem he sacrificed a hecatomb of oxen. 13 Since that time all dunces [ochsen] tremble whenever a new truth is discovered’ (Fragmente und Aphorismen aus Meinem Tagebuche, 1840. Qtd. in Moritz, pp. 308). Here is an untranslatable pun on the name of Gotama, founder of the Nyaya system, and go + tama, the most bovine (-tama being the marker of the superlative degree). See Stutley, ‘Vasistha’ and ‘Vishvamitra,’ and Muni, pp.379-80, 524, 835, and 872. Muni, however, does not mention the name S’abalaa or S’avalaa (as in the Ramayana). In his account, collected from various puranic sources, the name of the cow is Nandini (as in the Mahabharata), an offspring of Surabhi, the original kaamadhenu, who appeared during the Churning of the Ocean (samudra-manthana) or was created by Krishna (as in the Devi-bhagavata-purana 9.49). I have been able to consult only those mentioned above. Several New collections of Marx’s articles on India have recently come out, but I have no access to them. However, from the notices provided on the net, I gather that their editors have not addressed the issue of sources. und alles fuer eine Kuh! Rabindranath Tagore (1861-1941) rendered this poem (and eight others by Heine) into Bangla from the original German (as a footnote informs the reader) in Rabindranath’s translation of the ‘Wiswamitra’ song has been reprinted in Ghosh and Dasgupta (eds. ), p. 108 (second edition, p.137), Rabindra-Rachanabali vol.15 p.388, and more recently in Mandal, p.300. Both the letters are translated into German in MEW Band 31, letter nos. 48 and 49, S. 503-05, 506-08. Sabalah / Sabala have been uniformly transliterated as Cabala (S. 504, 507)! The 1853 article translated into German in MEWBand 9, however, retains Marx’s original misspelling, ‘Sabbala’ (9:133).The passage from the letter to Laura is also to be found in Karl Marx Privat, pp. 111-12, and quoted from it in Prawer pp. 379-80. Prawer however does not mention MEW 9 letter no. 48 (MECW 42 letter no.143) which also contains a reference to Heine’s song. Out of sheer curiosity I checked the French, Italian, Portuguese, Romanian and Spanish translations of Marx’s 1853 article, all available on the net, thanks to Marxists Internet Archive, <www.marxists.org>. No uniformity is to be found in the spelling of the two names: some prefer to stick to the original misspelling; some emend one or the other or both. Ramayana, Balakanda (Book I), vulgate, cantos 51-55; critical Edition 50-54; the Mahabharata, Adiparvan (Book I), vulgate and critical Edition canto 175 (a terse summary of the sprawling narrative in the Ramayana), also Salyaparvan (Book 9), vul. 45 crit. ed. 41, and Devi bhagavata-Purana vulgate 7.17 and 9.49, etc. 7The original German title is: Ueber das Conjugationssystem der Sanskritsprache in Vergleichung mit jenem der griechischen, lateinischen,persischen und germanischen Sprache (On the Conjugation System of Sanskrit in comparison with that of Greek, Latin, Persian and Germanic), with a preface by Carl (Karl) Windischmann. Not in this regard alone, but concerning other aspects of ancient India too, young Marx was heavily influenced by Hegel. The result was not altogether beneficial; Hegel misled him and badly clouded his vision. D.D. Kosambi has rightly contradicted Marx’s views and opinions about Indian history (pp.8-12) that are often mere echoes of Hegel’s. Hegel’s Lectures on the Philosophy of History has been summarily dismissed by Eric J. Hobsbawm as ‘not illuminating’ (p.21). The Italian translation by Gaspare Gorresio began to come out in 1847 and was completed in 1858; a French rendering by H. Fauche begun In 1854 and finished in 1858, but Hegel had died in 1855. Several studies on Hegel vis-à-vis philosophies in India are available. W. Halbfass’s study, pp.107-22, is worth reading. The whole of Ramayana was not yet available in German. See Winternitz 1:458 nn. The English translation of the Mahabharata by Kishori Mohan Ganguly did not begin to appear till 1883. Translations into other European languages that Hegel could read were still a far cry. A great public sacrifice, originally of a hundred oxen, from Greek hekatombe, from hekaton ‘hundred’ + bous ‘ox’. C.L.Dodgson (better known as Lewis Carroll) however objected to the sacrifice of no fewer than a hundred oxen – ‘a method of doing honour to Science that has always seemed to me slightly exaggerated and uncalled-for…. It would produce a quite inconvenient supply of beef.’ A New Theory of Parallels (1895). Qtd. in Moritz, p. 308. Emphasis in the original.). Cowell. E.B. The Carvaka System of Philosophy, The Journal of the Asiatic Society of Bengal, 1862, No. 4, pp. 371-90. Devibhabhagavata Puranam. Ed. Panchanan Tarkaratna. Kalikata: Nababharat Publishers,1388 Bangala Sal (=1981-82). Halbfass, W. Hegel on the Philosophy of the Hindus, in German Scholars on India, vol. 1. Varanasi: The Chowkhamba Sanskrit Series Office, 1973, pp.107-22. Hegel, G W F. The Philosophy of History. New York: Dover Publications ©1956. Hobsbawm, E. J. Introduction to Karl Marx. Pre-Capitalist Economic Formations. New York: International Publishers, 1969 (first published 1965). Karl Marks o Fredarik Engels. Pratham Bharatiya Svadhinata-Yuddha 1857-1859. Masko: Bideshi Bhashay Sahitya Prakashalay, n.d.
Kosambi, D.D. An Introduction to the Study of Indian History. Bombay: Popular Prakashan, 1975. Lutgendorf, Philip. Hanuman’s Tale: The Messages of a Divine Monkey, New York: Oxford University Press, 2007. Mandal, Sujitkumar. Bidesi Phuler Guchchha. Kolkata: Papyrus, 2011. Marx Karl and Frederick Engels. Collected Works, vol.12. Moscow: Progress Publishers, London: Lawrence and Wishart Ltd., and New York: International Publishers. Inc., 1979. Marx Karl and Frederick Engels. On Britain. Moscow: Foreign Languages Publishing House, 1953. Marx Karl and Frederick Engels. On Colonialism. Moscow: Foreign Languages Publishing House, n.d.
Marx, K. and F. Engels. The First Indian War of Independence 1857-59. Moscow: Foreign Languages Publishing House, n.d. Second Impression (based on the Russian edition prepared by the Institute of Marxism-Leninism of the Central Committee, Communist Party of the Soviet Union, in 1959). McLellan, David. Karl Marx: A Biography. London: Papermac. 1995. Moritz, Robert Edouard. On Mathematics: A Collection of Witty, Profound, Amusing Passages about Mathematics and Mathematicians. New York: Dover Publication, 1958 (originally entitled Memorabilia Mathematica, or The Philomath’s Quotation Book, © 1914. Muni, Vettam. Puranic Encyclopaedia. Delhi: Motilal Banarsidass, 1984. Prawer. S. S. Karl Marx and World Literature. Oxford: Oxford University Press, 1978. Sriharsha. Naishadhacharita. Ed. Sivadatta and V. L. Panshikar. Mumbai: Nirnay Sagar Press, 1928. Stutley, Margaret and James. A Dictionary of Hinduism: Its Mythology Folklore and Development 1500 B.C. – A.D. 1500. Bombay: Allied Publishers, 1977. Thakur, Rabindranath. Rabindra-Rachanabali, Panchadash Khanda (vol 18). Kolkata: Paschimbanga Sarkar (second West Bengal Government edition), 1994. Winternitz, Maurice. A History of Indian Literature, vol. I. Delhi: Motilal Banarsidass, 1981. Acknowledgements: Sourav Basak, Amitava Bhattacharyya, Sunish Kumar Deb, Rindon Kundu, and Nilratan Sarkar. The usual disclaimers apply.